PowerPoint presentation file is not a very friendly format for widespread distribution. You get to have PowerPoint program or PowerPoint viewer installed on your computer to open the presentation file. For Mac users, you may meet some incompatibility problems when you are trying to view the PowerPoint presentation in Windows platform. As is well know, QuickTime Movie (*.mov) is quite popular and friendly video format to share around -- from movie trailers to digital camera outputs and almost everywhere. There is no special program or operating platform required to view such a presentation in the form of QuickTime movie. Have you ever imagined that you can convert your PowerPoint presentation to QuickTime movie and deliver your slideshow in more flexible ways? QuickTime is a video compression and delivery format from Apple Computer. It is available for Mac OS X and Windows operating systems, and is distributed free of charge. You can easily find QuickTime players based on your computer platform to play your QuickTime presentation. Now the point is how to convert PowerPoint presentation to QuickTime movie. There are some screen recording programs that can record your playing PowerPoint slideshow and publish as a video file. But the recording process can be a little complex and output video could be not that good. A PowerPoint to video converter with PowerPoint to MOV conversion feature can be the most appropriate solution. Wondershare PPT2Video Pro is just the right one to convert PowerPoint presentations to videos of all popular formats including MOV. With this tool, what you need to do is importing your PowerPoint presentation files (you may import up to 12 files at one time), setting MOV as the output video format (more features like video resolution and frame rate settings are available), and converting your presentations (it may take you a few minutes if the there are a lot of slides in your presentations). Now you can get your QuickTime presentations. All the pictures, animations, and transition effects are well retained in the output MOV files. The MOV presentations make it easy to play the video presentations on computers, and even on portable devices such as iPod, iPhone, Pocket PC, Apple TV, Zune, and Blackberry. Besides, you may upload the MOV presentations to video sharing sites like YouTube to share with people all over the world. There are a number of situations that you may make good use of PowerPoint to MOV to demonstrate something when PowerPoint files do not work. You may be a university teacher, a trainer or a business man willing to show the best of your product or service, no matter who you are, a friendly MOV presentation format can be a complementary and flexible way to convey your idea to more people. 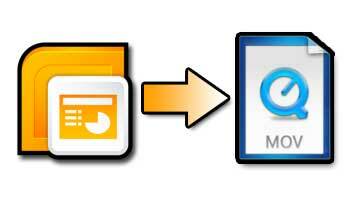 Enjoy the convenience of converting PowerPoint presentation to MOV!